In addition to light-colored walls and ceilings, artwork can help make a basement feel open. 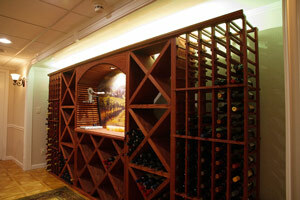 This wine rack and counter frame a mural that feels a lot like an extra window! Along with natural lighting and bright basement lights, there are many other ways that remodeling can improve basement lighting and brighten the area. Something as easy as using brightly colored basement walls, basement ceiling tiles, and furniture will give the area a cheery feeling. Well-placed mirrors can reflect light back into the basement and give the illusion of more space, and floor and table lights can do wonders to add beauty to dark corners. 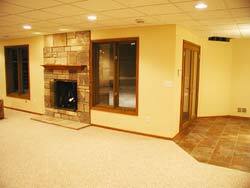 Total Basement Finishing can give you tips on brightening up your basement as a part of the design process. 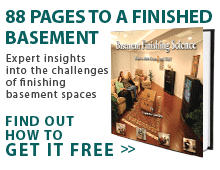 Contact your local TBF dealer to schedule a free estimate and get started on basement finishing today! Because a finished basement will tend to have less natural sunlight than the rest of the home, decorating the area with house plants is often a difficult endeavor. Homeowners who would like to add life and beauty to every part of their house should consider installing a basement aquarium. With the lights on, a basement aquarium can be a beacon of light in the basement, and with plants and brightly colored fish, it can provide a piece of living artwork in the home and serve as a centerpiece for the entire room. The hum of the filter and the sound of running water will add soothing white noise to the house, and it serves as a wonderful conversation piece for guests. An aquarium setup can be chosen on any budget, with beautiful aquarium fish ranging from a 50 cent Neon Tetra to a $500 saltwater exotic, so a system should be available to suit any need. A fireplace, either gas- or wood-fired, is another great way to add light to a basement room. Residential Design & Build recommends replacing old-school wooden doors at the top of a staircase with glass-paned French doors. These doors will allow light from the upper floor into the basement, aiding in taking away that "shut away" feel of the lower level. Additionally, a French door will help to make a basement feel much more like a beautiful part of the rest of the home, removing the visual barrier and feeling of isolation. For additional light, many homeowners will opt to install a beautiful basement fireplace in their home. Basement fireplaces add warmth, comfort, and light to this cozy, private space in a way that nothing else can. The crackling of the wood and the flickering flames are a soothing, peaceful addition, and even when unlit, a basement fireplace adds character and style to the area. Add some scented candles for accent, and the basement fireplace can quickly become a favorite place in the home. Total Basement Finishing has a locally owned and operated basement finishing contractor in your area that would like to help you plan an excellent basement finishing for your home. As basement finishing contractors, they're specialists in their field and are well-adapted to helping to create a finished basement space. For a FREE basement remodeling or refinishing estimate, call or contact us today!